Monarch Survival Rate soar to Over 95%, and can Help Yours too! 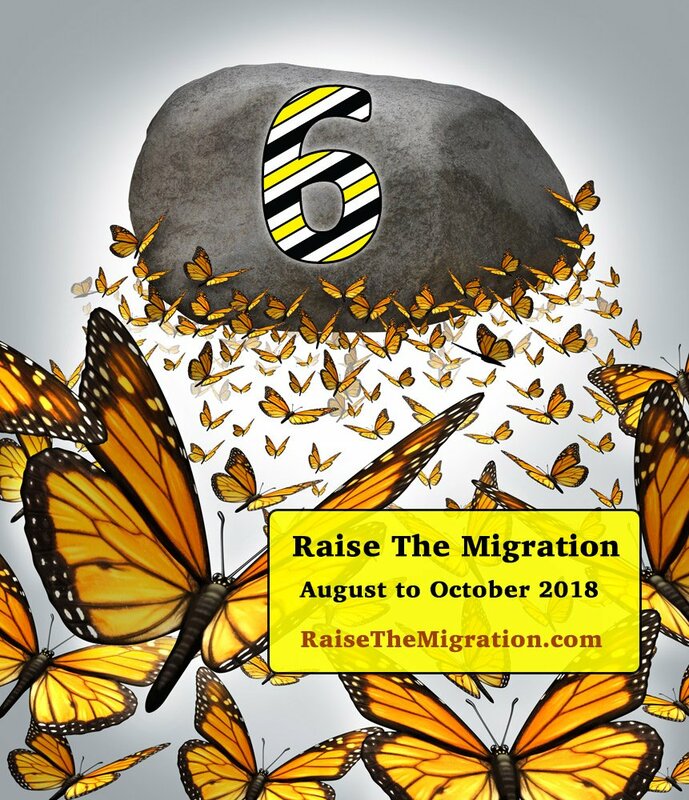 Raise the Migration 6 will start on Saturday, August 11, 2018. Sign up in the orange form at the bottom of the page. Of course, I’m never going to rent, sell, or otherwise share the information I’m collecting here. I hate spam as much as you do. And if you decide the content isn’t for you, there’s an instant “unsubscribe” link at the bottom of each email. I look forward to sharing a magical monarch experience. I have three chrysalises left to go. I expect the butterflies will emerge and fly off this weekend. In total this season I have raised 107 Monarchs. Twelve were earlier in the season and likely provided me with the eggs for the rest of the summer. I had a bit of bad luck with a virus and lost 5 caterpillars to black death. I plan to do this again next summer. Hi! I live in St. Paul, MN and am a bit confused as to which of the monarchs that I am currently raising will be the ones to migrate. I have all sizes from egg, to adults I am releasing tomorrow, and every stage in between. The eggs, I assume, will be the ones to migrate? What about the 2nd instars, 3rd, 4th, 5th? Will the ones that just made their chrysalis today and won’t emerge until the 22nd of August or so, migrate or still be mating and egg laying? Also- I currently have them all in the house in a room that gets plenty of natural light and they are getting wild milkweed but I worry about them going into diapause when they are not outside in their natural environment. Should I put all the mesh cages outside? Lastly, I am worried that we will get an early cold spell and I will still be finding eggs that won’t have time to grow and get going before the cold sets in. When can I last expect eggs in MN and when do the last butterflies leave this area to migrate? This is my first year doing this so any tips or advice would be greatly appreciated!Thank you! I’m new to raising Monarchs, and just released my first one 2 days ago. And now I have 3 small caterpillars that are 4 days old (from a second mother who visited the yard). I’m hoping that the original one will come back and lay eggs on my milkweeds, so I can raise some of her babies. But I don’t know if I would have time to raise any of my current caterpillars’ babies, since they probably won’t eclose until 9/6. I live in northeastern Illinois. I don’t know when they need to start heading south. So I don’t know when I should stop looking for eggs. I don’t want any of my babies to be stuck here after it’s too cold to fly. Can you tell me when they need to start their migration to Mexico — or when I should stop looking for eggs to raise? (I hear we’re supposed to have a warm 3 months, but don’t want to bank on that.) Thanks! hi Sue, in Minnesota, we typically get our last eggs the end of August or the first few days of September. You probably won’t get more eggs from the ones you’re raising, but there’s still plenty of time for another monarch to stop by your garden. Good luck! Hello! I hadn’t seen any caterpillars or eggs since May until this Thursday morning, when I found a caterpillar crawling around on my milkweeds. Now I have seven caterpillars and two eggs in a Backyard Safari Butterfly Habitat. I’ve taken care of them for the past day or two (adding more whenever I saw them since Thursday afternoon.) i measured three and they’re both around 20-25 mm, which ine website said meant they were instar 3-5. About how long will it be until they form cocoons? Theres quite a bit of frass and I’m trying to find out if there’s a point in replacing the two milkweed cuttings I have in the habitat with them tomorrow morning. One has been hanging out at the top of the cage since this morning. Thanks for all the information you put on this website, it has been a huge help with my garden! Hello again! Thanks so much for replying! Unfortunately, I will be unable to get a side-opening cage until around Christmas or next year. Is there any way I can make the pop-up one I currently have safer for the cats? They’re getting bigger–the biggest is around an inch or so and the others are only slightly smaller. I was unable to bring them inside the house this time, so they are on the patio. It’s not closed in, but I have not seen any predators in the cage nor have any of the cats escaped so I assume its alright. If I were to bring the next batch inside, would the AC negatively affect them? Also, my milkweed plants haven’t been forming seed pods since early June: whenever the biggest plant tries, they start small, curl in on themselves, and turn black. Do I need to add some sort of nutrient to the soil, or is something attacking the pods? This is the first year I’ve grown milkweed, or raised caterpillars outside of school. And finally (for now) if one of the cuttings I have has been stripped down to the stem, is there any hope of it forming roots and growing, or is it done for? Hello – I am really new at this. My second butterfly hatched this morning, and it appears I am keeping her overnight as she didn’t leave the plant I put her on after a 4 hour wing drying time in the house. She is sitting on my shirt right now. My gut tells me something is wrong with her. I’ve been feeding her nectar, but she doesn’t appear to be able to walk without falling over and she can’t hang without falling. She sits great on my hand and shirt. To me, her wings did not unfold as much as the 1st male that hatched Sunday. His wings were perfectly straight, and he had no problems flying. This little one still has folds on her wings. If anyone has any insight to this, it would be greatly appreciated. I live in Central Florida if that helps any. Have 13 new cats that emerged Sunday as well. Sunday was a great day here – such a beautiful and educational experience. Tony, It’s too late here in MD. zone 7 ag map to try to raise and release Monarchs now. However I would like to try next spring. I have not seen one Monarch this year. As a matter of fact all butterflies have been sparse this year. I have swamp milkweed, regular milkweed and butterfly weed in my garden. I need to find a source for eggs or cocoons. I live in a suburb of the District of Columbia. My neighbors and I do not use pesticides as one of us is raising bees and we all request the county and state not spray for misquotes. Could bt placed in rain barrels to control misquotes be transmitted to caterpillars when using the water on garden plants? ST. PAUL, Minn.—Today, a group of ten monarch researchers and conservationists from across the U.S. issued a statement highlighting concerns with the release of commercially raised and other mass-reared monarch butterflies and recommended against the practice. Wild monarch butterfly populations have declined by an estimated 90% in the past two decades, due to habitat loss primarily in the Midwestern U.S., where these migratory butterflies spend the summer months. Monarch butterflies are routinely purchased from commercial growers for release at weddings, funerals and other celebrations, and to raise in classrooms and exhibits for educational purposes. Out of concern for monarch conservation, some private citizens are also rearing hundreds to thousands of monarchs in backyard operations for release into the wild. While it has been suggested that releasing large numbers of captive bred monarch butterflies into the environment could help increase monarch numbers, the scientists who authored this statement caution against this practice. At a time when monarch populations are at record low numbers, research that informs conservation is absolutely critical. For example, scientists are trying to understand how monarchs may respond to changes in climate and habitats. When monarchs are observed at unusual times of the year, it is not possible to know if the butterflies were purchased and released or if they arrived on their own. In the western U.S., scientists are currently identifying the key areas where wild monarchs breed to guide restoration and enhancement efforts. Releasing farmed monarchs into the wild can directly interfere with that research. Mass production of monarchs in captivity can facilitate the spread of disease to wild monarchs. For example, higher levels of common diseases can build up in captive rearing settings, pathogens can evolve higher virulence in captivity and diseases can be introduced to new areas when humans move monarchs to areas where they may not naturally go. Currently, there are no requirements that commercial butterfly breeders or others who raise captive monarchs follow disease preventing protocols, nor are there government agencies that routinely tests commercial monarchs for diseases. This statement was released by ten scientists and conservationists, including: Sonia Altizer, Professor at the University of Georgia and Director of Monarch Health; Lincoln Brower, Professor at Sweet Briar College; Elizabeth Howard, Director of Journey North; David James, Associate Professor at Washington State University; Sarina Jepsen, Endangered Species Program Director at the Xerces Society for Invertebrate Conservation; Eva Lewandowski, graduate student at the University of Minnesota; Gail Morris, Director of Southwest Monarch Study; Kelly Nail, graduate student at the University of Minnesota; Karen Oberhauser, Professor at University of Minnesota and Director of Monarch Larva Monitoring Project; and Robert Michael Pyle, Co-coordinator, Northwest Lepidoptera Survey. Hi Susan, they have some valid points to consider about breeding masses of monarchs, but I have the same problem with this article that I do with many of the “scientific” articles regarding monarchs. They discuss theories, but there is no actual research to back up these theories. The reason I don’t discuss breeding butterflies in raise the migration or my raising guide, is because I think there is more potential for releasing sick monarchs back into the population when they are raised in mass…and too many pictures I see of people’s raising set ups are not suitable for raising healthy monarchs…in those unsuitable conditions, breeding would be a disaster. Perhaps breeders should have to be certified, and this could make a difference. Regardless, breeding practices should be explored to see if/how they are hurting the general monarch population, and how they might be improved. While I think that providing eggs/caterpillars to schools and for educational purposes can be a good thing, I’m not sure that monarchs should be bred for other event purposes…just my opinion as a monarch enthusiast. In my book, I clearly outline the processes I use to raise healthier monarchs. I raised over 100 monarchs from egg this season, and we only lost one….and it was not to disease, but a fluke molting issue. Yesterday I clipped some seed pods for future planting, and was shocked to find an inch – long caterpillar. It will be at least three weeks before he or she ecloses. Will that be too late for release? I am in the Detroit area. This season I have successfully raised and released 30 Monarchs, evenly divided between males and females. Thought I was done…. Hi Kay, all you can do is try to bring it indoors and see if there will be a warm enough window for release. Otherwise, you can leave the caterpillar outdoors and let it serve your ecosystem in other ways. good luck! PS…congrats on your 30 releases and thank you for supporting them monarch population! I have released 12 monarchs to date. I collected 15 eggs from the alleyways in northwest Evanston, Illinois. I had 3 that died in the the caterpillar stage. I have never had any fatalities before, and I have been doing this since 2007, with the exception of 2012 when the population seemed very low. The dying caterpillars seemed to become very thin, turn brown, and just expire. It was sad. However, I released one monarch on 8/15/, 1/ on 8/19, 1 on 8/21, 1 on 8/25, 1 on 8/27, 1 on 8/28, 1 on 9/1 and 1 on 9/3. 2 on 9/5, 1 on 9/7 and 1 on 9/9. I have one chrysalis currently – and it is very late. I am a little worried about this guy. He just formed a chrysalis on 9/23. This is the latest that I have ever had a monarch in this stage at this date. Hopefully, this butterfly will emerge successfully and then I will have released 13. I had to move one chrysalis from the side of the cage where it had formed, as there wasn’t enough room for it to emerge. I used band-aids to rehang it. I was a bit doubtful that this would work, but it emerged a healthy monarch. Since I started this project in 2007, I have released 187 — all eggs from the wild. It’s slowing down here on ‘Flutter by Acres ‘ just released # 172-# 173 both Males . Have three about ready to emerge at Church this morning ,only have two Caterpillars and one J, several Chrysalis left . It’s a good thing my Milkweed is almost done with for this year . Could you tell me why I have no Pods on some of my Milkweed which I cut back in early June ? I have a few Milkweed plants that I did cut back in June but they are closer to the house and they do have pods on them . I understand that the monarchs in the Adirondacks (northern NY) are the ones that migrate in the fall. What can you tell me about this…What makes this generation different? Would any monarch I raise here be a migrator? Or what triggers the development of a monarch into a migrator? I would like to try raising some, but since this is a special generation, I feel I need to know more. Any references on this subject? Hi Daisy, unlike other generations, these monarchs won’t sexually mature and mate. Instead they’ll migrate thousands of miles to the mountains of Mexico, where they’ll stay in sexual diapause until spring. It’s probably too late for you to start raising eggs now, but you could try raising a caterpillar if you find one…good luck! I need to know more! When I see monarchs in the spring, these will lay eggs, right? Is it that hatch that will not breed but migrate instead?I notice you mention the butterflies entering a non-breeding state. When does that happen; what initiates it? I’d like to know more about exactly what makes them the migration generation. Is it something in the individual egg-layer, or the egg, or the caterpillar etc., or is it something in nature like the temp or the daylength — or something like a hormonal response within the breeding cycle? If I would purchase eggs or caterpillars how would I know they would be suitable for the special mission of being raised in the Adirondacks? Hi Daisy, the adult butterflies that migrate won’t sexually mature and go into a sexual diapause. Factors that determine diapause are temperature and amount of daylight. If you are in New York, it’s too late to order eggs this season, but maybe you could find large caterpillars? Thanks Tony. It is indeed too late this year to do anything for monarchs, but I am preparing my thoughts for next year. I’m hoping I can learn enough so that in the spring when I do see a monarch or two, I will know what stage they are in as far as reproduction. I’m thinkin’ they will be breeding at the time they arrive in the spring, and that the 1st generation they produce in the Adirondacks will be the one that you discuss, the “diapausal” migrators. Do you think this is right? Because if it is, it seems I could get eggs at the same time the butterfly gals are laying theirs, and mine would assume the same timing — that is, if it’s determined by weather factors like daylight and temperature, and not by other factors I could not emulate. Hi Daisy, you have an opportunity to start raising monarchs in your region from whenever they arrive until the beginning of September. Unfortunately, they are not on a set schedule, and you can never be sure when you’ll see them. If you order some, I would suggest ordering by early August. Thanks Tony. So I could order eggs pretty much any time after I see the first spring monarch,up to early August? I will be ready! Thanks for joining us Mel and good luck with your eggs and caterpillars! Love your books and your tips. Assume I don’t need to sign up if I already get your emails. I have 12 that just made a chrysalis. Will they migrate or will there be a second generation? I’m in Jeresy and these are the first around here. The garden is full of eggs and cats and I have another 18 in the tent, but that’s all I can handle at a time. Hi Sandy, if you get butterfly garden tips, you will get Raise the Migration tips in August/September. Your batch of monarchs is borderline for mating or migrating. Whether or not they enter sexual diapause depends on temperature amount of daylight, and potentially other cues we’re not aware of. They will figure that part out after they are released…good luck! PS…it’s good that you are able to keep raising limits. It’s better for the monarchs you are raising…and you! Started a Monarch Waystation (#11040) in Hopkins, Minnesota on June 27th, 2015. Already, two females have laid eggs around the 35 milkweed plants that are growing here. Question.. On any milkweeds that are stripped down entirely to just the bare stalks by a caterpillar being raised in an indoor Lepidtarium to a potted Asclepias syriaca. Will this twenty inch milkweed plant be able to recover successfully afterwards? The cat has since gone to chrysalis this evening and I’ve six other eggs awaiting a hatch out that I saw deposited on August 9th in the garden. I’ve spritzed each egg’s leaf with amister once a day in the mornings and I have them laid out at the base of potted milkweeds (incatata) in the raising cage. How long until they develop a caterpillars? I wonder how you can tell dead eggs from ones that are simply too newly laid to tell yet on how far along they are with growth. Thanks for any reply back. Kudos for the idea of the Raise the Migration 3. It’s a hit around my circles. Hi Patti, congrats on the instant success of your waystation! I have never put syriaca in a container for raising before. You could either plant it in your garden or leave it outside in a protected area this winter to see if it comes back in the container next spring. Milkweed is resilient. Dead monarch eggs typically turn black…the FULL egg. Of course, for a normal egg the top turns dark which is the caterpillars head about to pop through… If you get an egg that turns fully dark, smash it inside the leaf and discard because it could have wasp parasites. Eggs typically take 4-7 days to hatch. Closer to 4 during a Minnesota August. Hope this helps! I found 5 cats last night on my milkweed, brought them in and have them in a 5 gallon bucket (I wasn’t expecting any cats)put a screen over them with milkweed inside. This morning 1 of the larger cats (about 1 1/2″)is on the screen. Should I leave it alone at this point? How would I be able to tell when it’s going to attach? I don’t want it on the screen, I wouldn’t be able to get into the bucket to clean and change the milkweed. Hi Anne, a side-opening mesh cage eliminates this issue. If you don’t have one, I would just set the screen on top of another 5 gallon bucket when you are cleaning the cage…good luck! Hi Sharen, congrats on the release of your butterflies. You can keep butterflies if they are not able to fly, but if you suspect they are sick keep them isolated and don’t put them on any garden plants…especially milkweed! You can take cuttings and let them sip nectar from those. I purchased 20 caterpillars & had a fairly good outcome. I learned the importance of paying close attention through the whole process until the last one encloses. The ones that eclosed were all healthy except one whose wings didn’t develop enough to fly like the rest. I didn’t think she would make it but took her outside for nectar & brought back into the castle. After a couple days she got stronger & started fluttering the immediate area by herself. Finally, I decided to leave her out where she seemed to prefer being. This is day 4 & she’s doing her thing still fluttering in a small area . My concern is O.E. & wonder if wing problems are always a sign of that disease or any possibility just may be “handicapped” without disease. Should I have euthanized instead of being glad she’s still making it. Thanks for any feedback. I live in Central PPennsylvania and iI am presently raising and releasing Monarchs. I did get a late start due to the wild Monarch has not made it to my Waystation yet. I purchased eggs and 2nd and 3rd instar cats that I have been raising. My question is what is the safest time to stop raising for the season so they will have a chance for a safe migration to Mexico? Hi Karen, details about Raise the Migration (including when to raise migration monarchs in each region) will be covered in the next email. Our local community garden here in Brooklyn NY, GreenSpace on 4th, is growing milkweeds and we would like to know more about raising monarch butterflies. Thanks. I live in Houston and just bought my first milkweed plant in May 2015. To date, I raised 7 caterpillars and I’m now counting down the days for my 6 chrysalises to transform into butterflies. My one milkweed plant was devoured, so recently I purchased 3 more. These plants don’t look so good… yellow leaves with brown spots and teeny tiny bugs among the flowers. I’m guessing they are aphids. Will try one of the remedies I read about. Looking forward to receiving your info/tips. Thanks! Would like to sign up. We moved from Fort St John BC (zone 2) to Grand Forks BC (zone 5) and would like more info on creating a butterfly garden now that we can grow a larger variety of plants. Hi Sarka, I send weekly butterfly tips that should help you to attract and support more monarchs. I hope they make it up to BC this season. Good luck! This spring (2014), I planted only 6 milkweed plants, and was thrilled to find a female Monarch laying eggs in early September. (Williamsburg, VA) I started a nursery on my back porch for 25 caterpillars and tended them diligently, while monitoring additional “wild cats” that I left on the plants. I’m happy to report that 22 caterpillars survived to pupate. 20 chrysalises eclased, with 16 adults surviving for release in mid October. I’m planning lots more milkweed this year! Thank you, Tony, for your eNews with helpful info. I’m happy to hear of your success Judith…and that you’re planting more milkweed this season! I live on the Big Island of HAWAII one acre of land at 1400 ft elevation. I have been growing monarchs at least 10 years, mostly successfully. It rarely gets below 70 deg. fahrenheit. We have monarchs year round I started with crown flowers, and have supplemented with Asclepias in several VARIETIES. There is even a variety with blue flowers. I have ordered 3000 seeds, of the cheapest yellow and yellow/orange seeds, and intend to spread them in good spots in the neighborhood like bobby apple seed. I live in St. Petersburg Florida and I am very interested in starting a butterfly garden. I also want to help save the Monarch Migration, but I need to know if I am in an ideal place to start this? Hi Lisa, there is a year round population of monarchs that exists in South and Central Florida…however some of the butterflies in your region are probably more adventurous in journeying both north and south. Some of these butterflies could migrate OR mate with other butterflies producing children/grandchildren that will! While you might not be in a prime region for migration monarchs, you can most definitely have a positive effect on the monarch migration.